"Well, this place looks friendly!" It’s been six weeks since I first got my hands-on with All-Stars Racing and several things have changed since then. 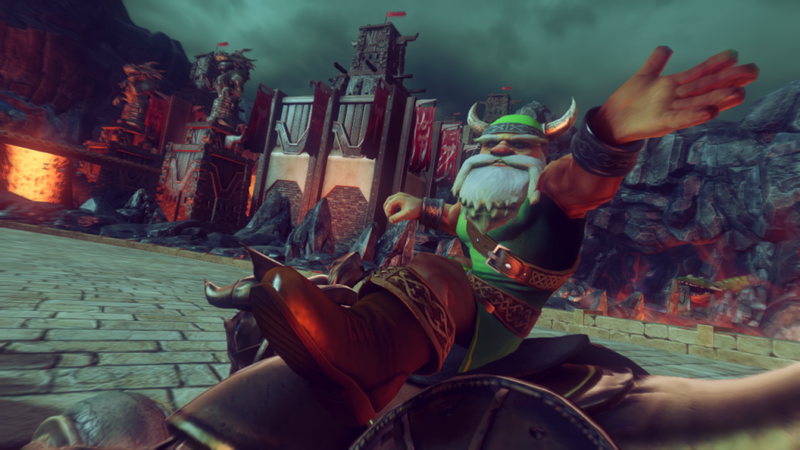 Joe Musashi and Shadow were introduced as new racers available, Adder’s Lair from Golden Axe has made its appearance, new items are available to attack your enemies with, and a Nascar Racer became a new playable character. How did all this affect my new experience with the game? Read on. For once, I'm going faster than Sonic...and this Hideki Naganuma music rocks! When I first sat down with the game, I decided to make a one-two combo of Joe Musashi and the Adder’s Lair track to try all the new stuff at once. Big mistake. Joe is very fast, but has very poor handling and often I found myself crashing into walls or being smacked down by other players. Poor Joe never had it so rough. What made it worse for me is that Adder’s Lair is considered one of the harder tracks that come later in the game. You start the track in your watercraft…in Lava! 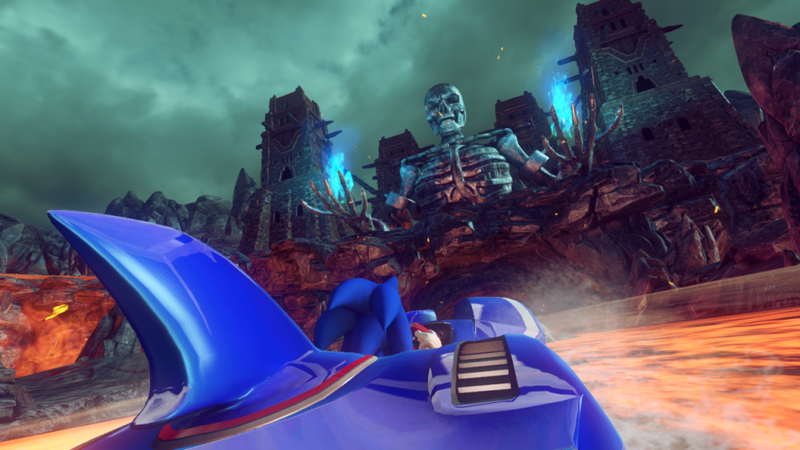 Before you get your vehicle on land, you go inside and under a castle greeted by a giant skeleton statue with his arms outstretched. He reminds me greatly of the skeleton from the character select screen from the original Golden Axe. Once inside the roads diverge into two different paths, both with steep and twisting turns. Soon, the roads end and you’re in the air. Dodging stalactites and stalagmites as you do tricks to gain boost (now done on the right analog stick) all the while attacking your opponents or defending yourself from them. Speaking of, let’s go into the items. There’s a fair amount of new and creative items that were shown in this new build. A great offensive or defensive weapon are the hornets (no, not the car). You can either shoot a swarm of them out at a racer ahead of you which will cause his vehicle to spin out of control, or you can drop one giant hornet from behind who will break into a swarm when hit by another driver in pursuit. The second new item I noticed was a giant blowfish. I’m not sure exactly what it does, but it seems to be like a large mine where you drop it and it explodes on another player who touches it. I don’t know if you can shot it forward however. The best of the new ones is the catchers’ mitt. When activated, a giant glove comes out and if an opponent tries to attack you from the rear, the glove will catch that weapon and it will now be yours to use right back at them. I’ll take this baby over a shield any day. Psst! Hey buddy! C'mere. It's okay, just com-SLAP! One last thing before I go into my feelings on the big news that came out yesterday. I went back to the Panzer Dragoon track again and noticed some new things. First, there are some graphical additions here and there. Mostly cosmetic, but I did notice that the dragon near the beginning of the track acts much more animated and the frame rate has had a noticeable increase and plays a bit smoother. Now, some may be wondering what I think of the other playable racer revealed today. Danica Patrick. Well yes, she’s neither a Sega or Sonic character. However, she’s good publicity for the game. NASCAR is a huge, HUGE franchise in America and when I told my family I got to see (not meet, sadly) her in person they got all excited. She’ll be driving a car littered with Sonic All-Stars Racing decals and that can only help with advertising for this game and in my opinion, advertising is something Sega’s been doing poorly with their games as of late. This is proof that focusing on fewer retail games allows them to not only make sure they are AAA titles, but get the marketing push they need. If only getting away from freeway traffic were this easy. 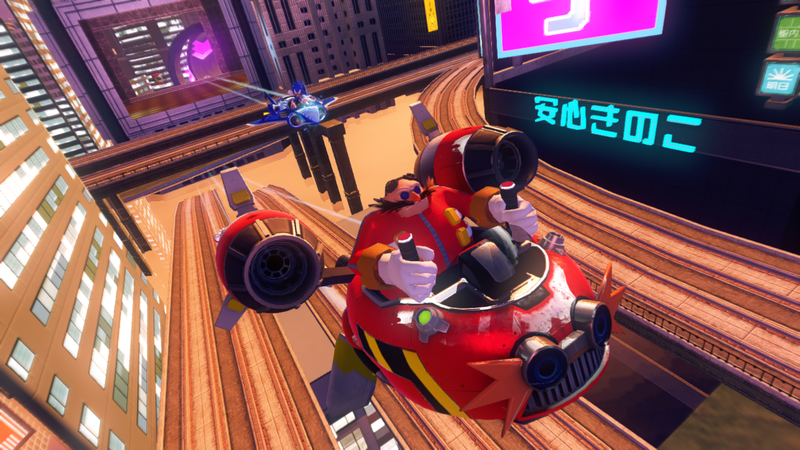 I was told by Sumo Digital’s Joe Neat that there will be even more revealed at the San Diego Comic-Con and I hope to see what bonus feature the Wii-U version will bring to the game. I’ll be giving you another report on the game in July. How the heck did you get into E3? Tell meeeeeee~~! Not where I live. Maybe it’s more of an Eastern-US thing. Although I do want to see a NASCAR car transform into a boat and plane. Can they make the decal change too and make new ones? That would be a nice trick to add. …I’d probably be so distracted watching, I’d go off the track. Great preview! Now I can hardly wait for the Comic-Con reveal! Looking forward to trying this game. 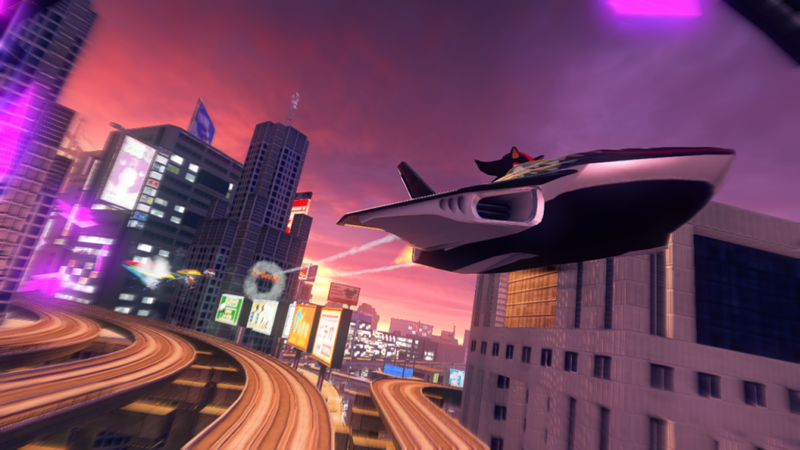 Also, Shadow’s jet looks glorious. GLORIOUS. Can I get one?